Guides, HowTos and Walkthroughs go here. If you would like to submit one, you may post it under Game Discussion and it will be moved here if approved. 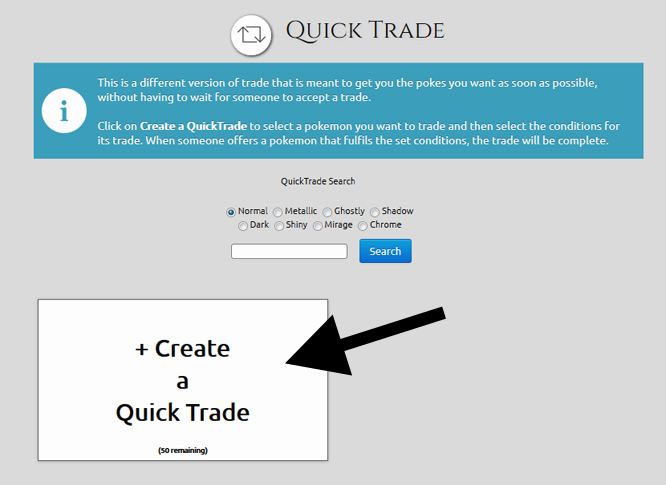 Where can I access Quick Trade? 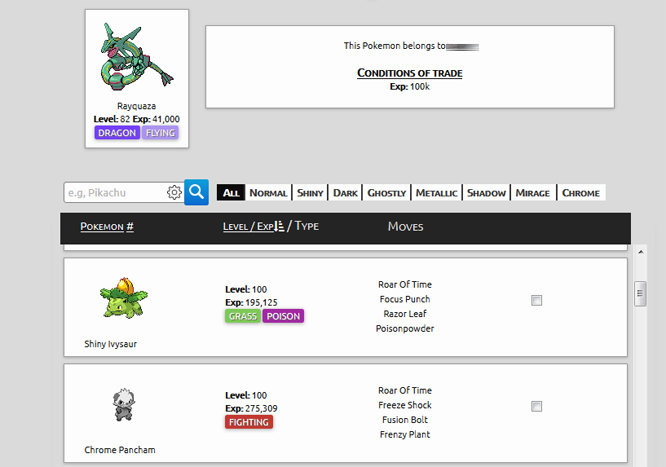 How to put pokemon in Quick Trade? 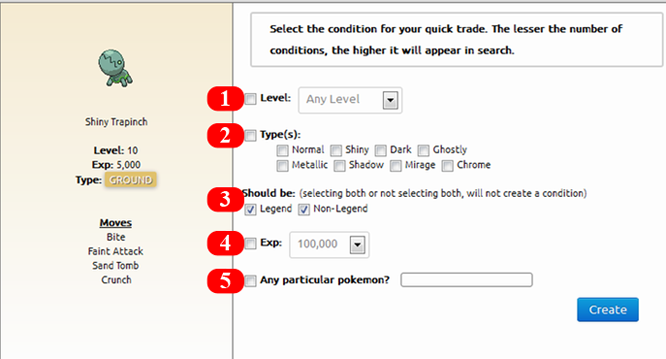 Search for the pokemon you want to put in Quick Trade, and click on “Select”. After you are done, click “Create”, and then “Confirm”. Warning: Remember to check Step 3 in the above image before clicking Confirm! Double check that those are the conditions you want. How do I search pokes on Quick Trade? Type in the name of the pokemon you’re searching for, and select what type of pokemon you’re looking for. 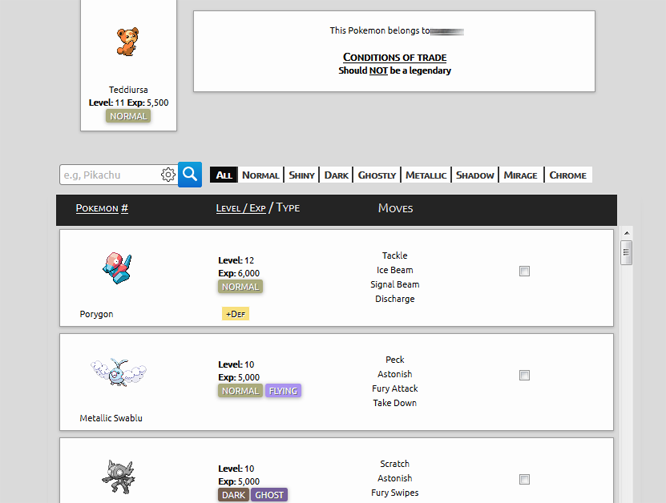 How do I offer on other players' pokemon(s) on Quick Trade? There are different conditions for Quick Trade. They are: Level of pokemon, Type of the pokemon(Metallic, Normal, Mirage etc), Legendary or Non-Legendary Pokemon, Amount of experience it has, and lastly there is a Specific Pokemon requested. 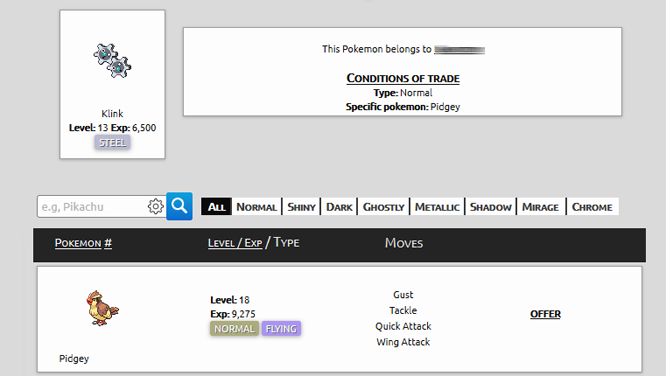 In the next few examples I'll show you a few conditions that you'll need to fulfil when offering on players' pokemon in Quick Trade. 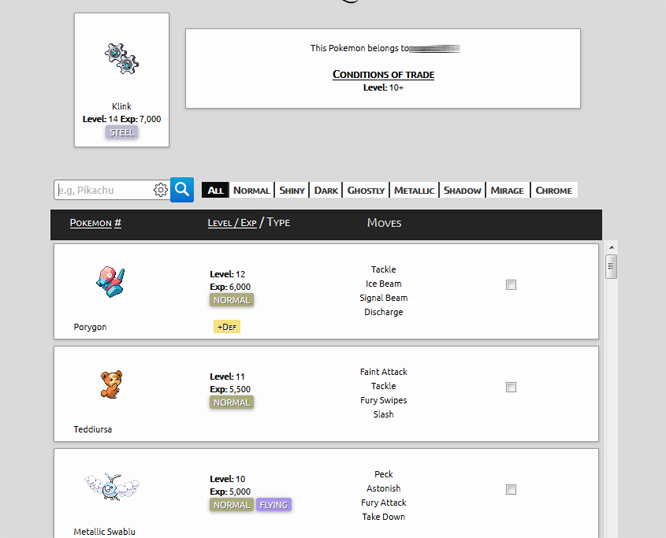 As you can see, only the pokemon that are Level 10 and above are made available to offer. This means any pokemon between Level 10 and 100 will be made available to offer. 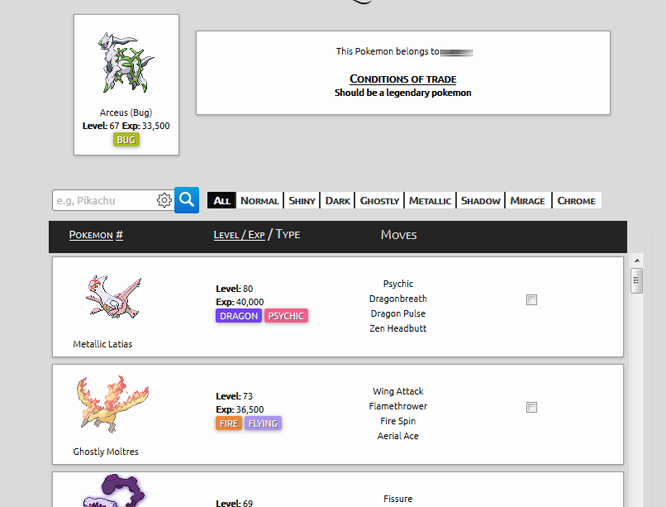 As you can see only the legendaries and non legendary pokemon are made available to offer on each of the image respectively. Only the pokemon that have 100,000 or higher experience are made available to offer. Only a Normal-type Pidgey will be made available to offer, other type pidgeys will not be shown. Last edited by randomuser on Sun Jan 25, 2015 4:08 pm, edited 11 times in total.